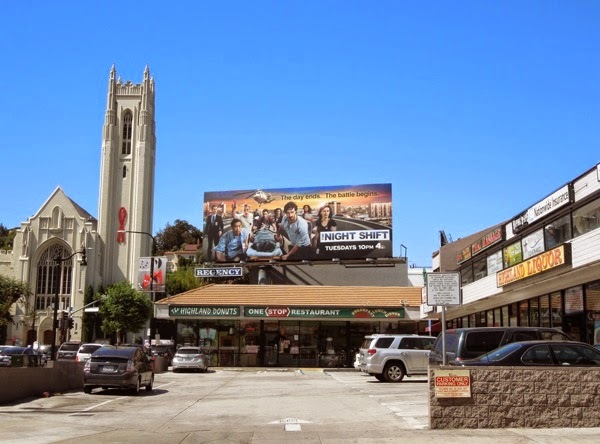 Now that the major networks have killed off their flagging shows and the poorly performing rookie series have flatlined, it's time to try a whole new slew of dramas and sitcoms to fill the time slot voids. 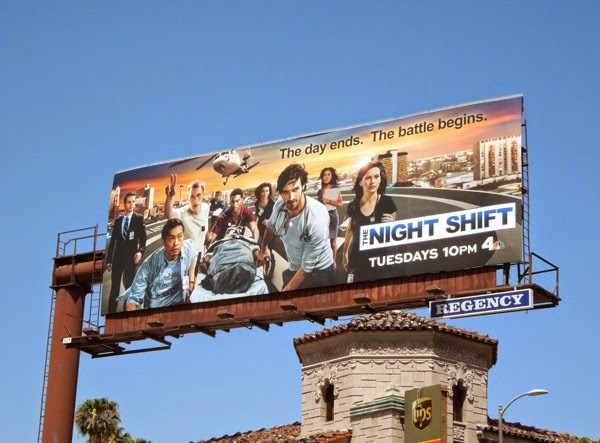 One of the first up is The Night Shift from NBC, yet another medical drama but as the name implies this one focusing on the battles for life when the sun goes down at San Antonio Memorial Hospital. Eoin Macken stars in the leading role as 'TC Callahan', an unorthodox ex-Army doctor recently returned from three grueling tours of service in Afghanistan and he's joined by some familiar faces, like Six Feet Under's Freddy Rodriguez, LOST's Ken Leung, Royal Pains Jill Flint and Revolution's Daniella Alonso, to name drop just a few. 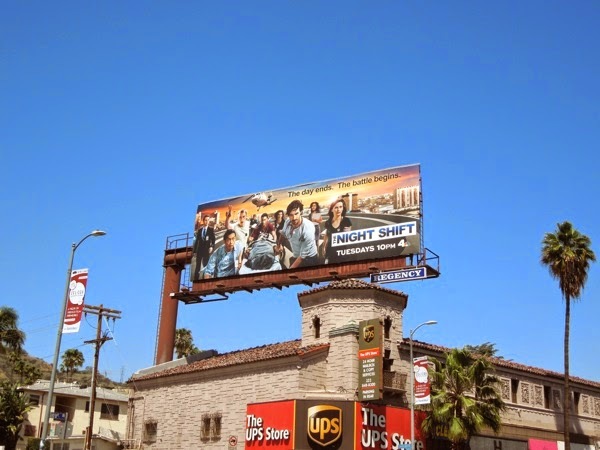 This new after hours medical drama billboard was first spied along Sunset Boulevard on April 30, and later snapped along Highland Avenue on May 11, 2014. 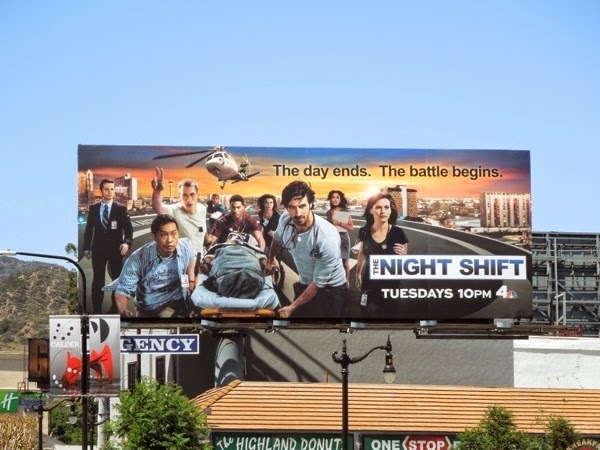 Be sure to also check out the season launch billboard for Animal Practice sitcom, where this particular hospital stretcher billboard creative may have gotten its inspiration from. 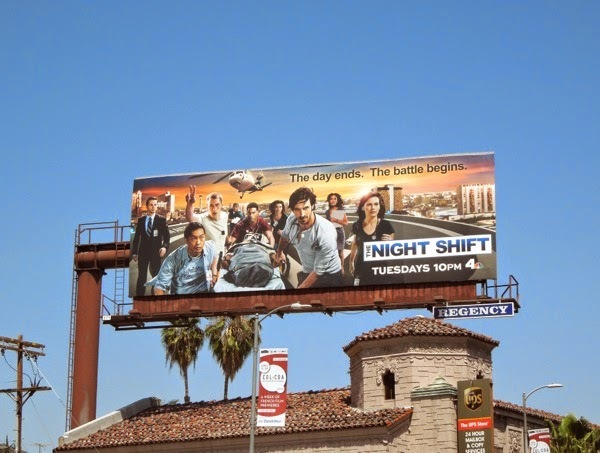 Only time will tell if this new collection of doctors, nurses and administrative staff can fix NBC's Tuesday night schedule. Physician, heal thyself, and whilst you're at it give those mainstream TV ratings a helping hand too.